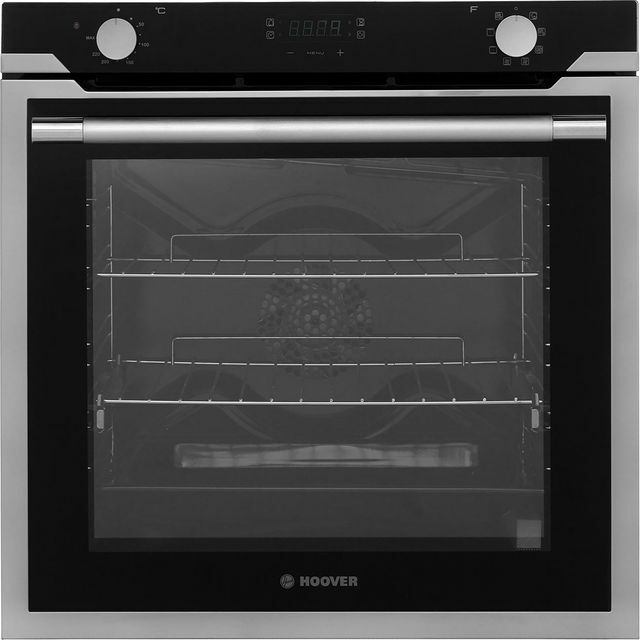 With its stylish design, this built-in electric single oven from Hoover is ideal for modern kitchens. As it’s multifunctional, it has lots of cooking options, so whether you’re roasting, baking or grilling, you’ll always get incredible results. There’s also a handy electronic programmable timer that you can set to turn off when your food’s ready. It’s really easy to check on your meal too, thanks to the telescopic shelf runners which pull out smoothly, stopping spills and accidents. And, because it has a grease-proof enamel interior which prevents splatters from sticking inside, it just needs a simple wipe to keep it clean. A nice looking oven. It was supplied with the wrong manual for some reason!! A lot larger than our previous oven so had to re-route the hob gas pipe. Also the grill drip tray is a strange set up would have preffered a normal one. My brother in law put this in for me , he said it was straight forwards and fitted perfectly. It looks smart and stylish in my kitchen. I'm Always a bit worried about new appliances and getting to know how to use them but this is pretty easy as you just turn the dial to select a function and use touch to select timer etc I'm Very pleased with this oven. It has a large 78 litre capacity which is good for large families or for lots of food cooking. Especially for those roast dinners! It is also Multifunctional Oven which is excellent for all different type of cooking, slow cooking , grilling and it even has a special pizza function. (Oh we do love pizza in my house!) I was really impressed when I wiped it down , it really is easy to clean! The oven has LED lights built into the door which look great. One of my favourite things is the soft close door ?? The oven is very quiet and heats up very quickly. Everything I have cooked so far has been evenly cooked and cooked in the time allocated. Instructions are easy to use. I'm really happy with this oven it ticks many boxes. Very pleased with this oven. Very stylish and looks great. It has a large 78 litre capacity which is good for large families or for lots of food cooking. It has a Multifunctional Oven which is excellent for all different type of cooking, it even has a special pizza function.It is easy to clean thanks to the Grease-proof enamel coating on the oven. The oven has LED lights built into the door which look amazing and are energy efficient. The oven also has a soft close door which eliminates the door from slamming. The oven is very quiet and heats up very quickly. Very impressed and would recommend.